PALM BEACH GARDENS, FL. 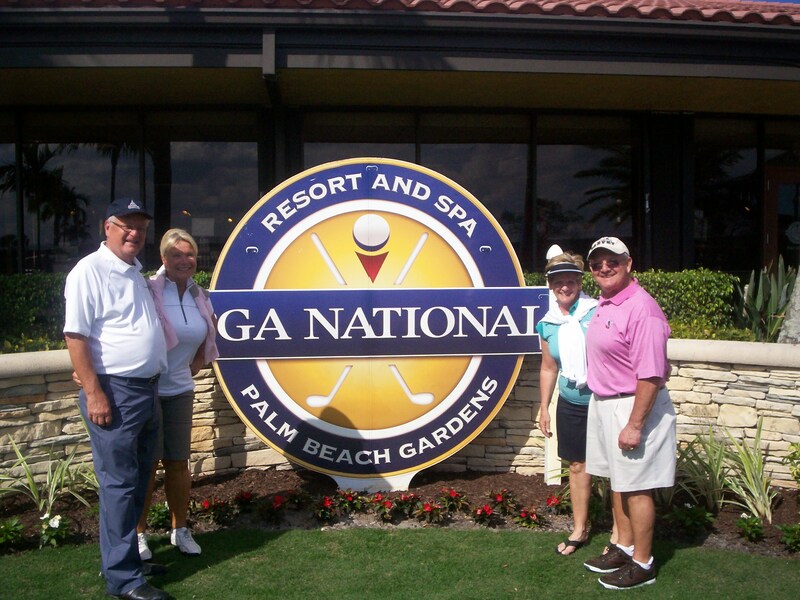 – The Fazio is the newest course at PGA National Resort & Spa. Playing it was to be the highlight of a four-day stay there, and it was, but for more personal reasons. 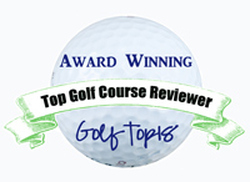 This site is designed primarily to be informative about the golf destinations we visit, and this report on PGA National will be, as well – eventually. This time I come first. In one round on that layout I hit my best iron shot in years and years, holing out a 6-iron from 140 yards on the third hole (Witness celebration photo below). It didn’t spur me on to a good round, though. In fact, the end result was my worst score of the nearly 20 rounds played on this trip, which is now into its eighth week. And no, for those ready to ask, did the hole out produce an eagle. (My drive, though hit solidly, wound up behind a tree and required a chip-out before the magic arrived – if for just that one big swing). 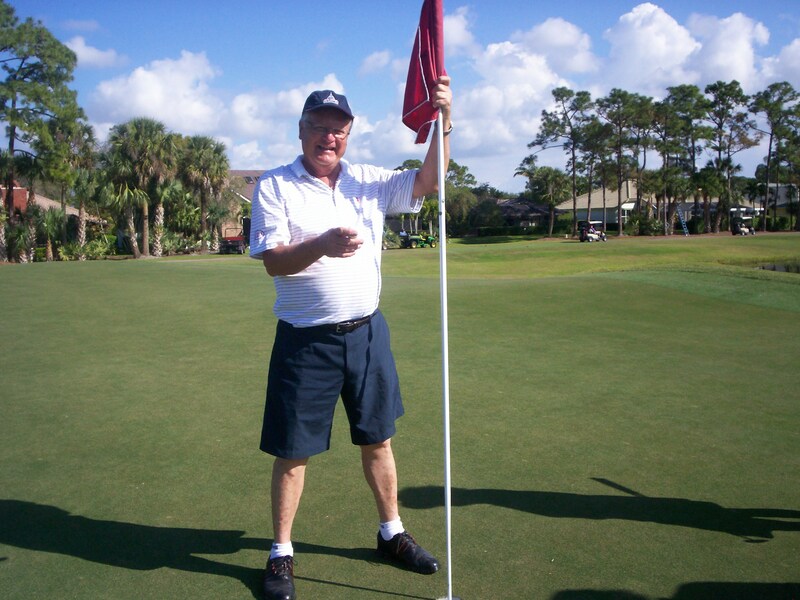 Not only that, but all I could do was shake my head when the round was over after being outdriven by 30-50 yards on every hole by Gene, my most affable 81-year old playing partner from Connecticut who is 12 years my senior. The golf gods were working overtime on this strange day. What wasn’t at all strange was The Fazio, a layout designed by the well-respected Tom Fazio II. It opened on Nov. 1, 2012, so not that many golfers have played it yet. Technically, the course isn’t all that new, though. Originally it was called The Haig, a tribute to the legendary Walter Hagen. The Haig was opened in 1980 as the first course at PGA National, which now has five 18-holers. The Haig was designed by George and Tom Fazio. They are uncles to Tom Fazio II. He modernized the course with new grass, greens and tee boxes, and his finished product marks the first time those three Fazios have worked on the same layout. That makes it something special. Within Chicago’s golf world George and Tom were the architects for Butler National, the all-male Oak Brook club that hosted the Western Open from 1974-90, and Tom II for Conway Farms, site of September’s BMW Championship. George and Tom had long been busy at PGA National. They were also the original designers of The Champion Course, which was the site of the 1983 Ryder Cup and the 1987 PGA Championship, won by Larry Nelson. My only previous visit to the resort was to report on that ’87 PGA, one which I remember most for the sultry August heat that somewhat overshadowed the golf played that week. 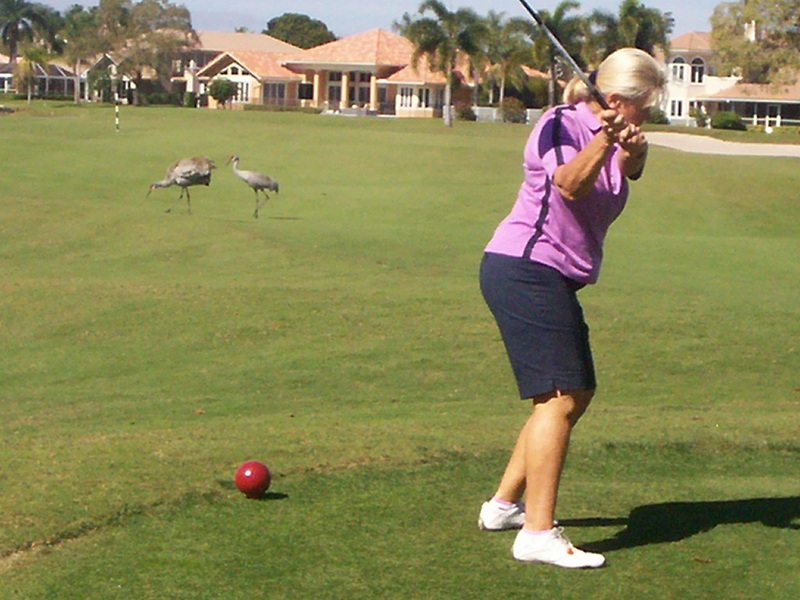 This time the golf was more peaceful, with even some curious cranes (below) roaming the fairways with the golfers. PGA National underwent some major changes prior to my return, most in the form of a $100 million renovation that included the creation of The Fazio. The Champion Course underwent a $4 million redesign by Jack Nicklaus’ his design team in 1990 followed by a renovation in 2002. That’s when the Bear Trap – billed as one of the toughest three-hole stretches in golf – was born. I didn’t get to play The Champion Course, as it was being readied for the return of the PGA Tour’s Honda Classic. Nor did I play The Estates Course, a Karl Litten design and the only one of the PGA National layouts located off the main resort. It’s about five miles away. My other golf was played at The Palmer Course, which also has some interesting history. It was an Arnold Palmer signature course when it opened in 1984 as The General. Palmer supervised a total renovation in 2006, which led to the renaming of the layout. It produced the most enjoyable of my three rounds during the stay. The other round was on the Squire, a 1981 Tom Fazio creation that honored Gene Sarazen – the first golfer to win the professional Grand Slam. You have to cope with some blind shots to fully appreciate this course. The big-money renovation has significantly changed PGA National, for those who might remember it just from its earlier years. For golfers, it now includes Dave Pelz and David Ledbetter teaching academies. 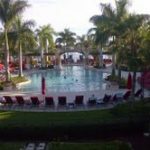 All 379 guest rooms received total makeovers in the renovation as did the popular breakfast buffet, then named Citrus Tree Café and now called Palm Terrace. 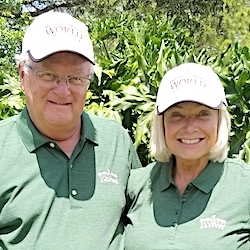 We stayed on the resort throughout our stay, played fun social golf were three very nice couples (among them Ed and Linda Alberts of Williamsport, Pa., above) and visited most of the dining spots, including the high-end Ironwood Steak & Seafood. Easily our favorite was the iBAR, which put on one of the best Happy Hours we’ve ever experienced. 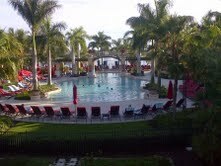 The resort also has a expansive pool area (right), croquet, tennis and a variety of other attractions. But, appropriately, the best is the golf.